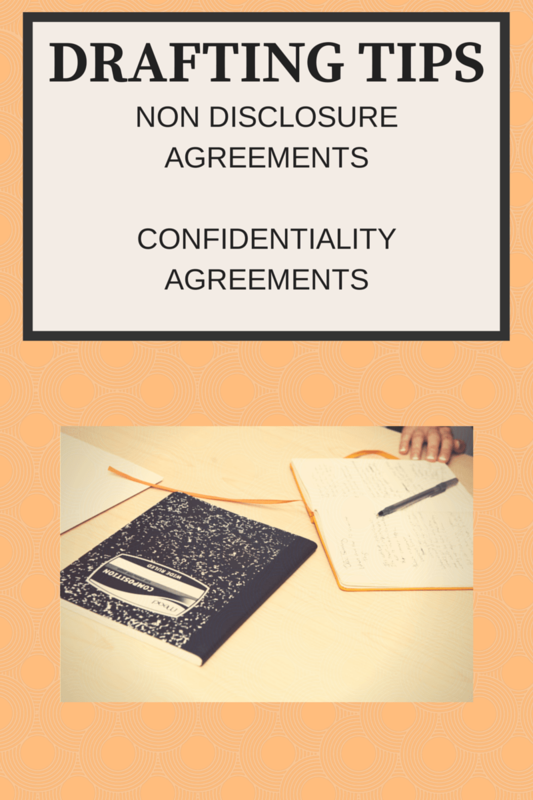 Almost every business discussion between two parties requires disclosure (or exchange) of confidential information, which mandates the execution of a non-disclosure agreement (NDA), also known as the confidentiality agreement. The main goal of NDA is to protect confidential and proprietary information shared by each party. In most cases, NDAs act as first step towards subsequent business agreements and contracts, which include additional provisions to cover complexities of business transactions between the parties. While drafting a confidentiality (non-disclosure) agreement, it is crucial to ensure interests of both the parties is adequately secured by including the required provisions in a well-defined manner and excluding provisions that are not required. Confidential information should be specifically defined for both the parties. Mostly generic definition is used to include a broad category of information, which is not advisable. Always be specific to exactly define the scope of confidential information, which may be same or different for both the parties. For example, in case of a discussion involving mutual exchange of confidential information by both the parties, the type of information to be shared by each party may not be same. Hence, providing an exact definition of confidential information for each party makes sense in such cases. Based on the same principle as explained above, confidential obligations for each party should be defined for both the parties, which again can be same or different for each party. Similarly, it is important to define right to take proactive action for each party in case of breach of any provision of confidentiality agreement (NDA). Non-Compete Clause: including a non-compete clause in a NDA is not advisable as it can become problematic for both the parties. If the parties intend to include a non-compete provision, it should be a part of separate business agreement between both the parties. Assignment of Intellectual Property Rights (IPR): it is strongly advisable to specifically define IP assignment or non-assignment if such clause is included. In case it is decided to include IP assignment clause, appropriate care must be taken to ensure that the clause is not generic (broad) and its full scope and intent should be defined. A disclosing Party should specifically disclaim grant of any kind of IP rights. No Warranties: it is always advisable to state in NDA that confidential information is shared “As is” without any warranties. Non-solicitation: a non-solicitation clause can be included in the agreement with proper definition of scope, intent and duration, all of which can be practically enforced and justified. For example, such non-solicitation clauses can prevent each party from hiring and soliciting employees from other party for a certain period of time. In certain cases, non-solicitation clauses can be replaced by no-hire clauses as well. Term of NDA may or may not be same as the term of contractual obligations, and hence, specific definition of term is required. Perpetual clauses should be avoided unless the same are within the context of discussions between both the parties. It should be ensured that signatory should be authorized person to sign the agreement. In addition, full name and designation of parties should be included to make it legally binding. How Courts Interpret Confidentiality Agreements? Judicial interpretation of NDAs will vary across jurisdictions and laws of relevant country will prevail in case of any dispute. One major challenge faced during such disputes is to prove that the NDA has actually been breached, and subsequently to prove that the party to NDA has indeed breached said NDA. It should be ensured that negotiations and discussions do not get stuck due to unacceptable clauses of the NDA. The lawyers involved in drafting and negotiating NDAs should always assign priority to the business goal, and unnecessary clauses should be avoided whereas utmost importance should be given to standard clauses in NDA. In case of any complications, it is always better to stick to the primary goal of signing NDA, i.e. confidentiality and restricting usage of confidential information, while additional agreements should be executed to include related clauses (Non-compete, Non-solicit, IP Assignment, IP Licensing etc.). Feel free to discuss this topic on Twitter or Google+. You can subscribe to our future content by submitting the form below or following us on LinkedIn.